Across New York’s public housing communities, young adults are knocking on neighbors’ doors to hand out recycling bags and teach folks how to use them. They're also growing and harvesting organic produce for residents at farms in the center of the housing developments. It’s all part of the Green City Force mission to engage young residents in service while training them for careers in the green economy. They’re creating an interconnected community by empowering young adults to live sustainable lives as they build the green city that all New Yorkers want to see. Green City Force's model is based on partnership. It brings together the reputation of AmeriCorps, the assets of New York City Housing Authority (NYCHA), and an array of public and private partners to improve the environment, boost the urban economy, and invest in the next generation of changemakers. 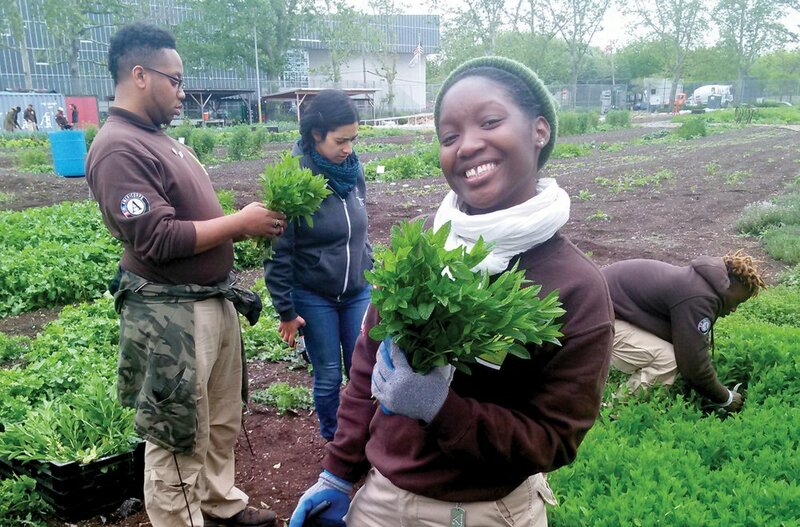 Green City Force's AmeriCorps members are recruited from the public housing communities they serve. These young adults, who live closest to the issues, take a leading role in addressing them. Offering a full-time service year to unemployed young adults, which allows them to develop job skills and gain hands-on work experience with ongoing coaching. Growing and distributing organic produce to local residents through five active large-scale farms within NYCHA communities. Performing in-home audits, energy and water efficiency upgrades, and recycling programs. Implementing large-scale energy efficiency contracts through GCF's Social Enterprise group. Teaching young adults about the benefits of a sustainable lifestyle and training them to practice and promote this lifestyle through the Love Where You Live education program created for NYCHA residents. Promoting a shared sense of community among NYCHA residents, with Green City Force members acting as credible messengers and ambassadors encouraging sustainable behaviors.